Elbesee Seat Frame Three in One . 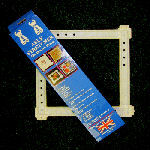 so called because you can have three projects on the go with this frame!! 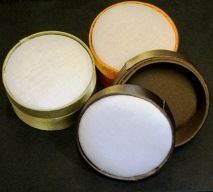 For embroidery, crewel and counted thread projects. Easy to assemble, instructions enclosed. Leaves your hand free to work your canvas. High quality polished wood. 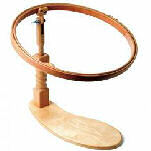 Includes 15, 20 and 25 cm hoops (6", 8" and 10") . Each hoop is attached to a stalk which fits into the frame .the hoop can then be moved back and forward and up and down to allow you to finish off your work . Either slide the base of the frame under your thigh and sit on it or slide the base from the ront between your legs . works well .very portable . a winning piece of kit!